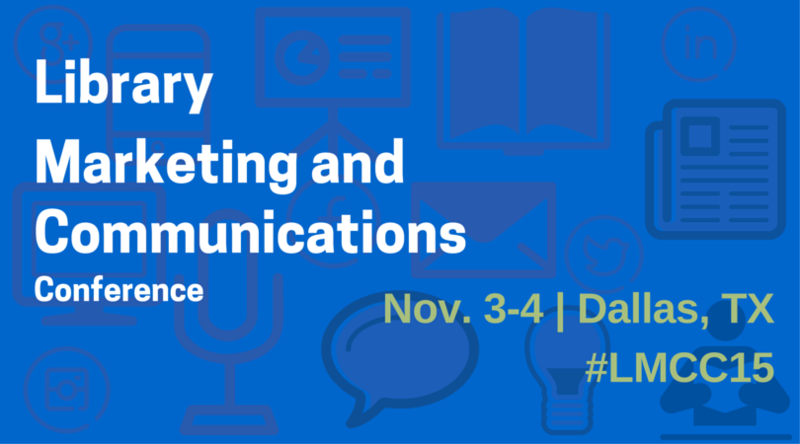 The 'M' Word - Marketing Libraries: New Marketing and Communications Conference! New Marketing and Communications Conference! Have you heard about the new conference that's being designed just for library marketing and PR people?? 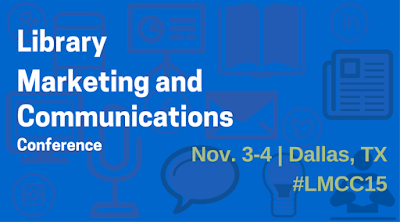 It's called the Library Marketing and Communications Conference, and it will be held just outside Dallas, Texas, this November. I'm leading the Program Committee that's planning the event, and I couldn't be more excited!! This new event is an outgrowth of four previous meetings. Kieserman Media began the Association of Library Communications and Outreach Professionals (ALCOP) and ran conferences of the same name near Philadelphia in 2011 and 2012. That group ran similar shows, renamed the Library Communications Conference (LCC), near Philly in 2013 and in New Jersey in 2014. When its leader, Bob Kieserman, decided to stop organizing the conferences, a group of former attendees decided to reboot and relaunch them. Those of us in the budding Library Marketing and Communications (LMC) group believe that library workers deserve a small event that's geared specifically toward the necessary work of marketing communication (MarCom), which includes public relations, social media, branding, and related topics. We feel that, if more library employees improved these skills, then all types of libraries would be in better positions to have their messages heard and to have their services well-used and appreciated. The Program Committee of the Library Marketing and Communications Conference (LMCC) is interested in receiving proposals for presentations that apply the latest trends, best practices, and research in the field while providing practical tips that can be immediately applied to any library's communication and marketing program. Fill out Session Proposals Form here. Please Note: There will be a discounted block of rooms at the Crowne Plaza; rooms include breakfast. Earlybird Registration is $275 and includes 2 lunches plus drink / snack breaks. is generously sponsoring this conference. They're working hard to ensure that it's affordable and valuable. I can't thank them enough for all they've done! I hope to see many of you in Dallas this fall!